New pintle getting built this week, the old one was mild steel so was rusting away. Timber underneath doesn't look in too bad shape though some of the surface splintered off getting the old pintle off. So is there some rot treatment it would be wise to apply? I was thinking of just cleaning it up a bit then a couple coats epoxy to seal, Any better options? I've had good success with Ronseal Wet Rot Wood Hardener on bits of soaked timber. It reacts with the moisture in the wood and uses it as hardener. If there is some rot, it'll work better than epoxy. If the wood is thoroughly dried out and solid, epoxy will do fine and is stronger, but needs to be protected from UV afterwards (paint or varnish). If the wood is dry then I would build it up with thickened epoxy - probably a mix of wood fibres and microballoons. 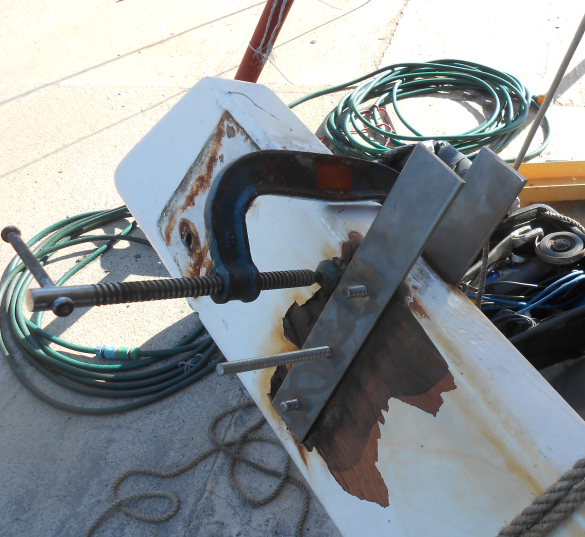 line the bolt holes with same mix and redrill to size. Bed the new fitting in polysulphide. I agree with the above two replies. Agree with Yngmar, ronseal wood hardener is fantastic stuff I've used it on mahogany that had gone soft with rainwater ingress with good results. As a protection I use ronseal wood preservative. I'd bed the new pintle on butyl tape - I'm not into thickening resin and prefer something that has some 'give' in it. Thanks all, might struggle to find any ronseal down here, but the wood is hard already, doesn't seem to be any soft spots. 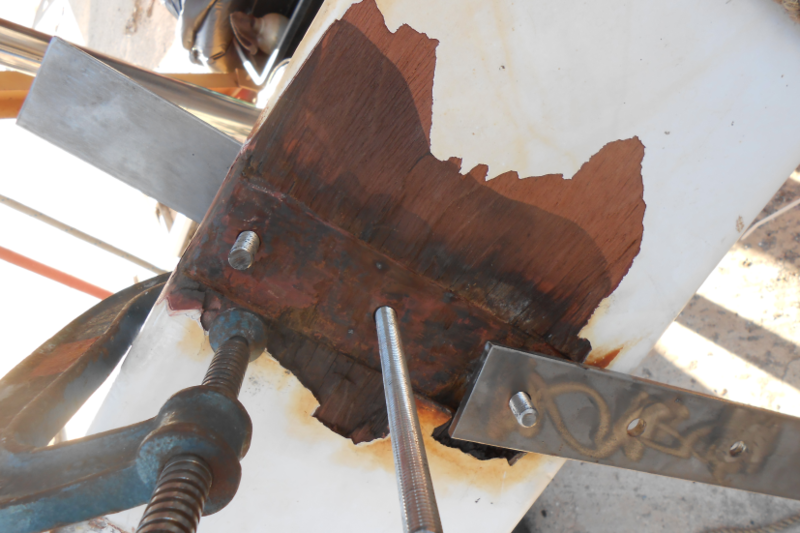 The splintering was caused by the old pintle expanding as it rusted. Might end up being some epoxy. New one in stainless for the price of a few rods and some flat bar and solid bar. Not the prettiest by dead strong! 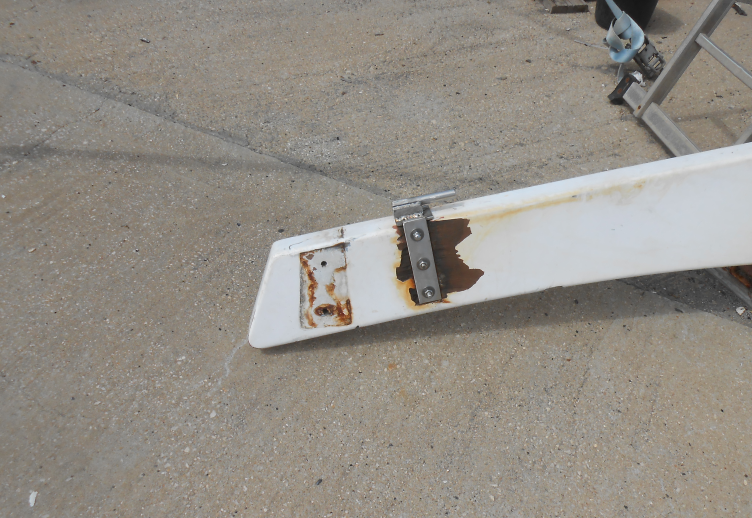 A HDPE bushing can help prevent the pintles and gudgeons wearing out. Was thinking of new bushes while it's off. Maybe get some acetal machined up (got some stashed somewhere)?? Or would HDPE be better? Acetal for choice. The bearing at the bottom of my rudder in the shoe is from 1992 and no wear. Spare i had made at the time was a coffee table ornament for years. I suggest saturating first with clear cuprinol wood preservative then the wood hardener. I would use HDPE for bushes as its very tough and doesent swell when immersed. Never use nylon. Last edited by HunterWanderer; 02-07-18 at 21:41.